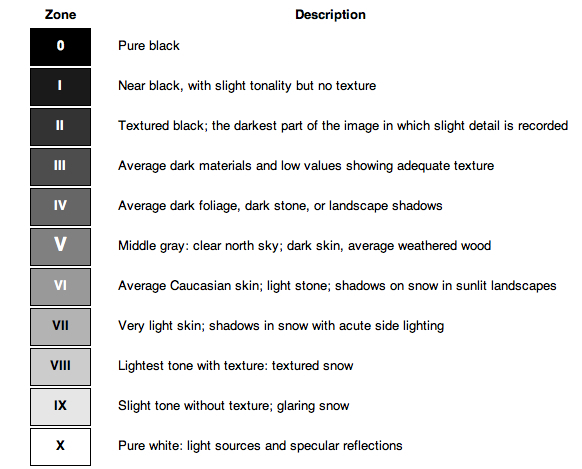 Zone System in Digital Photography came from from analog black and white photo and is used for the optimal exposure and Post Processing in Digital Photography. The Zone System was introduced by Ansel Adams back to the forties, but also the fans of the “all-digital” should experiment Zone System creatively. In contrast to the photo-chemical standard development processes of the analog black and white material used in large-format cameras, we have more room to play with the Zone System in Digital Photography. This is an individual process of adaptation of the dominant contrast motif in various shooting conditions using a theoretical construction of 11 (zone 0 to zone 10) Zones by densitometry accurately in calibrated gray values. The considerations of the zone system apply similarly to the CCD or CMOS sensor of a digital camera, the computer monitor and printing, for example inkjet or laser printer. The term (the paper form of the image) again has the most restricted range of contrast. A monitor can be another, but still limited compared to the original range of contrast. The digital image processing features with corresponding software is much richer way, so the gray values ? ?can be adjusted individually or in relation to each other, which in the darkroom is feasible only with great difficulty or not at all. Another advantage of the digital photography is that, histogram can be assessed to verify whether there is over or under exposure. Aperture and shutter speed can be as with an analog camera. Thus as with the negative or slide film waiting until the film development, to assess the guess is not required. In general, parts of the scene falling in Zone III will have textured black, and objects on Zone VII will have textured white. In other words, if the text on a piece of white paper is to be readable, the white will be in the manner so that it falls on Zone VII. This is a general rule of thumb. This Article Has Been Shared 6825 Times! Cite this article as: Abhishek Ghosh, "Zone System in Digital Photography : The Ten Zones," in The Customize Windows, February 24, 2013, April 26, 2019, https://thecustomizewindows.com/2013/02/zone-system-in-digital-photography-the-ten-zones/.